Prepare frico ghosts: Preheat oven to 425°F. 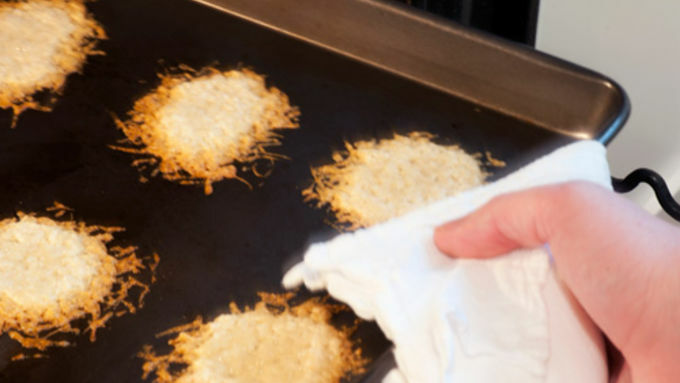 Spread grated parmesan into clumps about 1/4 inch thick on the pan/silpat. Bake until until the clumps have melted and are just turning brown at the edges. Remove from oven and cut the frico with a small ghost cookie cutter while still warm. A cherry tomato with a slit cut in the top forms a stand for each ghost. 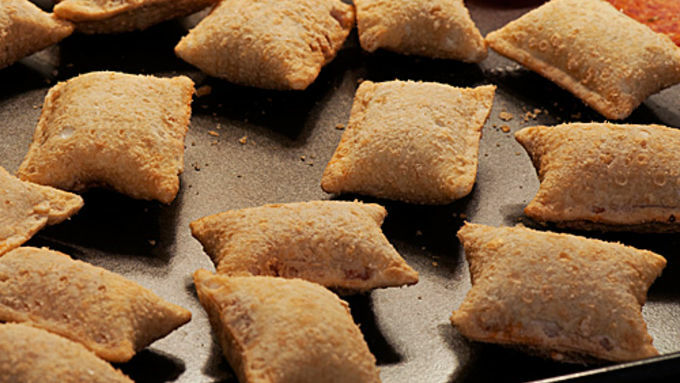 Bake pizza rolls as directed. Pop the pepperoni in the oven for about 3 minutes to crisp it up as well, if desired. Spread the marinara on a large platter. 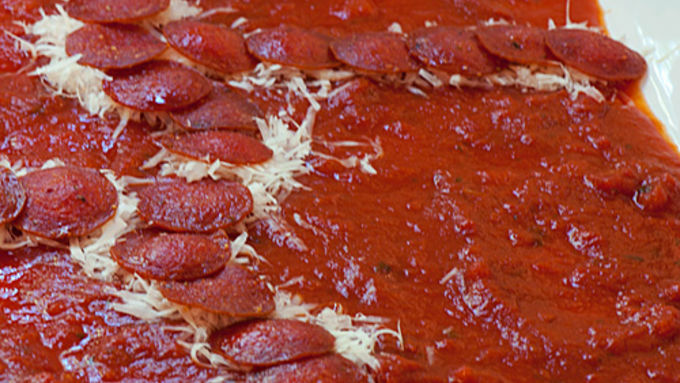 Sprinkle the cheese to form winding paths, overlay with the pepperoni. Cut the very end off a few pizza rolls, place cut side down in the marinara to form headstones. Add the tapenade for freshly dug graves, and place the frico ghosts and parsley as desired. There are a lot of good Halloween centerpieces out there, but few you’d actually want to eat. I mean, sure, mist billowing out of a well-carved pumpkin looks impressive, but all you’re left with is dried out squash and a couple of burns from the dry ice. You need something vaguely creepy, vaguely easy, and, most importantly, very tasty. Stuffing lychees with blueberries to make delicately tropical eyeballs might work, however, these are a little more appealing to the adult partygoers than the kiddos. 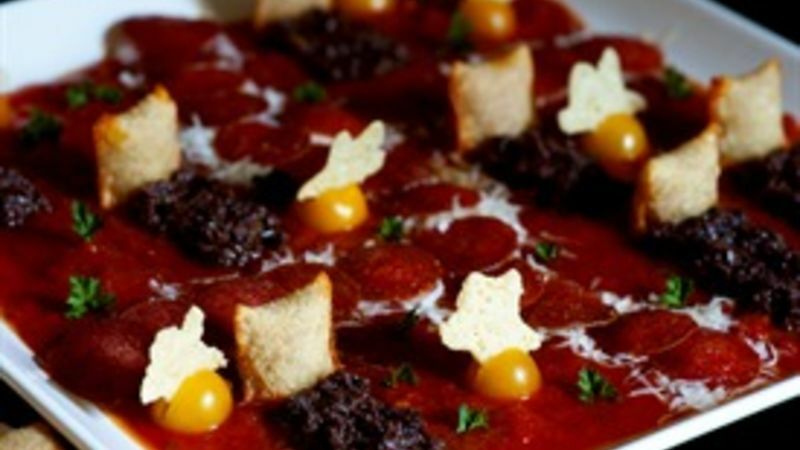 For this recipe you'll need to make your frico “ghosts”. (Frico is a baked grated cheese crisp - you probably last had frico as a fancy garnish on a Caesar salad.) To make the frico, spread finely grated parmesan into clumps about ¼ inch thick on a silpat, or a non-stick (and I mean really non-stick) baking sheet. Pop into the oven until the clumps have melted and are just turning brown at the edges. Remove a piece of the frico from pan (or silpat) with a spatula and, working quickly, use a small ghost-shaped cookie cutter to form your ghosts. “Quickly” is the key here, and small batches as well! The shapes must be cut while the cheese is still warm and pliable, or else the frico will shatter— but not to worry, if things cool down you can just slide the pan back into the oven briefly to warm the cheese for the next go. To form a stand for each little frico ghost, cut a slit in the rounded end of half a cherry tomato. After that, it’s all cosmetics. 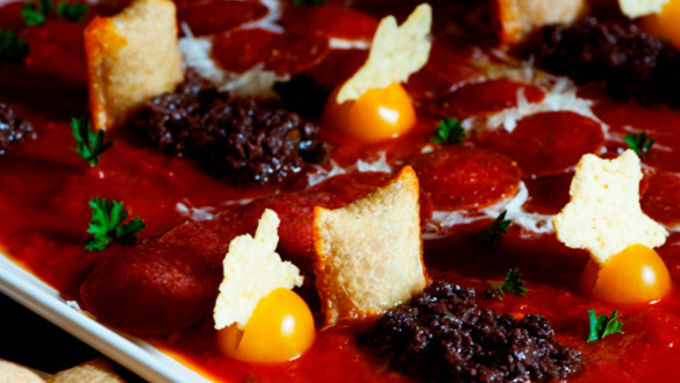 Spread a little tapenade in front of the pizza rolls to make the freshly dug graves, lay out your pepperoni with some parmesan to make a suitably winding, spooky path, and set up your frico ghosts. Add few sprigs of parsley (even the most barren cemeteries need some greenery), the bowl of remaining pizza rolls for dipping, and you’re set!